DiscoverVin: The French Dinner: June 28 2014 in a secret venue in Melbourne! 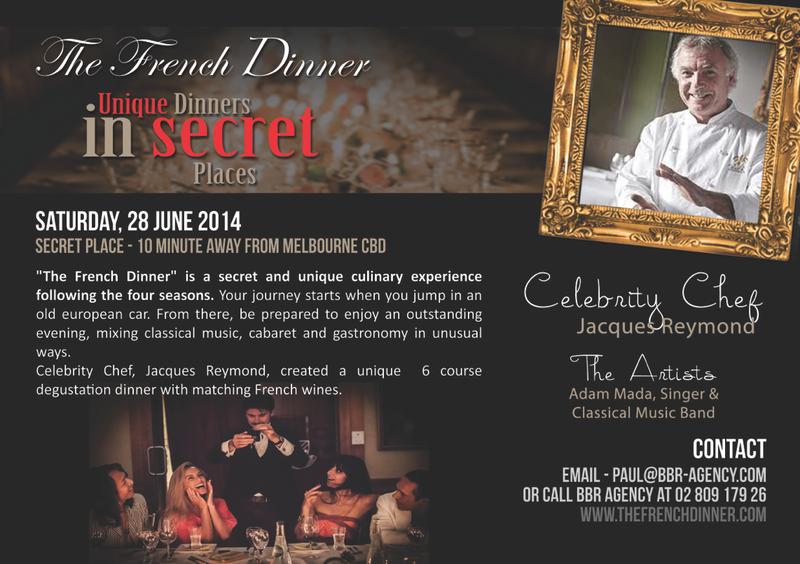 The French Dinner: June 28 2014 in a secret venue in Melbourne! DiscoverVin as well as our friends Domaines Rollan de By and Chateau Beycheville are excited to be part of this unique event. "The French Dinner" is a secret and unique culinary experience following the four seasons. Food created by legendary chef Jaques Reymond in a secret location. Champagne aperitif and classical music. 6 course degustation dinner prepared by Jacques Reymond with matching wines (6 glasses of fine French wine by DiscoverVin) , French cabaret, and... Sorry, but everything else is a... SECRET! For more information and to purchase tickets click here !